ABBA, flat-packed furniture, meatballs, Volvo estate cars. Some cars transcend mere transport and become embedded in the national psyche, and the big Volvo load lugger happens to be a case in point. At the moment that honour falls on the V90, and whilst it is clearly a Scandinavian product the money behind the brand is now Chinese thanks to Geely. The marriage of Geely and Volvo is proving very fruitful. Geely provides large wheelbarrows of cash but doesn’t feel the need to change Volvo into something it isn’t. The result is all the good Swedish bits (stylish, contemporary, mature design) remain, but there is a whole new side to Volvo and that is seriously hi-tech drivetrains. The resulting plug-in hybrid set up is very good indeed. It combines a 2 litre four cylinder direct injection petrol unit which utilises both turbo and superchargering to produce a very impressive 316 bhp all on its own. The electric motor drives the rear wheels and can produce an additional 86 bhp and more importantly 177 lb ft of torque. A 10.4 kWh battery pack provides the juice and is cleverly positioned in what would normally be the transmission tunnel. The oily bits are completed by an 8 speed automatic gearbox which sends petrol power to the front wheels. The net result of all of this cleverness is the ability to deliver serious straight line performance when everything is combined, the convenience of petrol power when you need it, and the ability to run in pure electric mode when you don’t. With a full battery Volvo claim you can cover 28 miles in electric mode, which normally means around 15 – 25 miles in the real world. However after a week of testing we found 25 – 28 miles is entirely feasible which is an impressive feat. As ever with plug-in hybrids you do need to maximise EV running for it to make sense. We averaged 40.7 mpg across a week of mixed running, but motorway trips using the petrol unit resulted in 30 mpg. Of course if you stick within the 28 mile EV range you could use no petrol at all. It is fair to assume that if you want a plug-in hybrid estate you may be interested in the boot. Volvo has chosen to prioritise rear seat leg room but you still get 560 litres of boot space and we think it is a very good balance, thanks to the limousine like interior space. We would prefer to squeeze the bags in rather than the back set occupants, as the bags will tend to complain less on a long journey. If you do need a bit more space it is good to know that folding the rear seats down (remove occupants first) liberates a substantial 1526 litres of space which should cover most tasks. Despite the clever placement of the battery pack which means no loss of boot or underfloor space, fitting in the rear electric motor does mean you get a slightly smaller petrol tank but with 50 litres available the touring range remains sensible. The V90 TwinEngine is an intriguing proposition. It is very refined, beautifully made, and pleasing to look at inside and out. In fact we think it has the best interior in its class. The ability to cover 28 miles in electric mode is also very attractive with substantial fuel bill savings, combined with serene and brisk progress making it addictive. 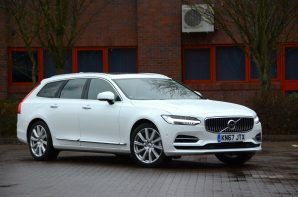 It isn’t the most involving car to drive and the lack of manual override for the 8 speed ‘box is a big omission, but it does everything a Volvo estate should with the added party trick of that drivetrain. Well done Volvo, and thank you Geely.